Why Do Old People Want to Chat, Snap and Gram? I am seeing conversations about Instagram and Snapchat growing in popularity and outside the typical teen demographic. Since I like being seen as an adult, and not one who is trying to be cool by desperately grasping at things to regain some appearance of youth, for years I have pretty much tried to ignore the newer social media platforms (of course after learning some basic facts about them and warning my children of the dangers of misuse). But it seems I finally do get pulled in. First it was Facebook. 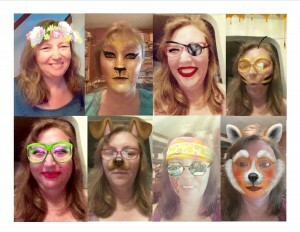 Then my family got Smartphones, and one of the first things my kids did was to get on Snapchat. As I struggled with figuring out the basics of my new phone, they were happily Snapping away, with their friends and each other. When I asked about all the giggling, they told me about Shapchat and asked me to join in, urging me to set up an account. Fast forward a couple months. I know how to navigate with my phone (mostly) and I am hearing about how one or the other of my children has done this or that from one of their siblings. I had just talked to him/her and did not hear about it. How did they get this info? From Snapchat. I’ve been left behind. I continued to get frustrated with the app, since there were things I knew were possible to do, but I couldn’t figure out how. Over Thanksgiving break, they all taught me some tricks and we had fun adding to our “stories” with pictures we took of each other during a long car ride. I still don’t do much with Snapchat, except follow stories (it still frustrates me that I have to ask for help). It can be more useful than a text when I see something and want to share it with one of them, but for regular conversation, I still prefer to use the phone as it was intended, or I text for non-urgent questions or comments.